This is the single most important question Ben Jordan (pictured above), VP of Customer Experience at InVision, asks himself before sending an email to a customer. InVision is a prototyping, collaboration and workflow tool which is used by companies as diverse as Airbnb, Adidas, Microsoft and Evernote. As an avid tester of subject lines, message styles, and filters, Ben’s job is to turn email addresses into loyal users. At InVision, this means 365 days worth of onboarding and nurturing Auto Messages — triggered by both time and behavior — that are fired off using Intercom. Far from being seen as spam by those who receive it, InVision enjoys email open rates of over 75%, and has a robust community of more than 400,000 customers. 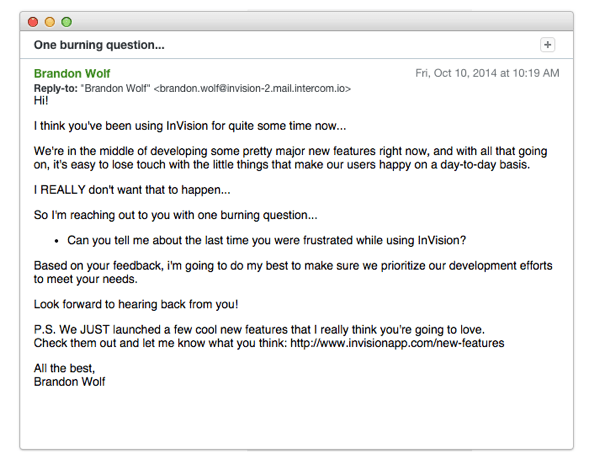 Here’s Ben’s story on how Intercom helps InVision improve customer engagement. 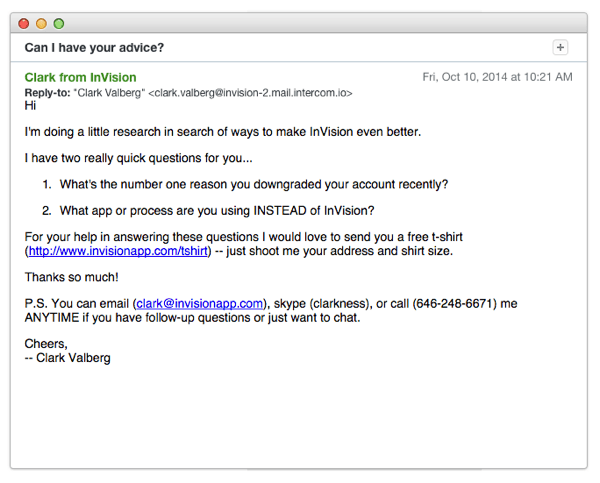 Up until a few months ago, 60% of our nurturing emails were sent by Clark Valberg, the co-founder of InVision. People loved it, of course. How awesome is it to be able to engage directly with one of the founders while you’re evaluating a product? As you can imagine this strategy doesn’t scale well when you’re growing rapidly and your CEO soon gets caught up with other things. Users are quick to dismiss things that seem fake or contrived, and personalized messaging is one of the best ways to get users to actually receive and read the message you are sending. People want to feel catered to and there is no better way to achieve that, in my opinion, than through personalized communications. Our strategy around lifecycle marketing is to put customer experience front and center; although pretty basic, our main success metric is open rate. If you think about what makes you a loyal customer — apart from a fantastic product — it’s how the company treats you from the moment you give up your email address. Do they fall quiet the second you enter a credit card number? Do they send you truly useful content that helps you do your job better? We’ve set up a year’s worth of Auto Messages in Intercom, and we are constantly iterating this schedule. It starts with your standard Day 1, Day 3, Day 5 welcome drip feed. But we also drip messages on Day 14, 60, 100. We fire off messages when a user upgrades, downgrades, tries certain features, or is stuck at a certain step. It sounds like a lot, but with some testing it’s really pretty easy. We A/B tested and experimented a lot with who the message came from, and what the format of the message should be. Messages that have an ask in them perform significantly better when sent as a plain text email versus a well designed HTML email. We have seen various improvements when changing the content of the message, but nothing changes performance better than making sure the from, subject, and format are relevant to the subject matter. After 1 week — what do you think so far? As part of our nurturing program, we send out an email a week after signup users for their opinion on the product. This really helps us gauge their experience and if they are having any difficulties. This touchpoint has been critical for engagement. Adding a postscript is a pretty simple way to draw extra eyeballs to a certain call to action. After 6 months — what would you change? 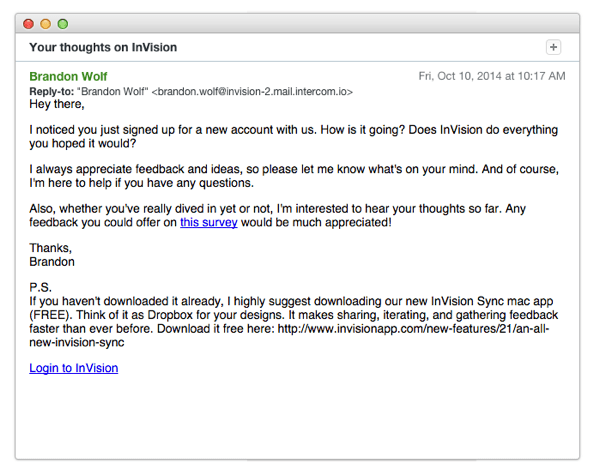 This email is sent six months after signup to users who are active in the tool. We want to ask for real feedback once the user has really experienced our application. The one burning question is, “What would you change about the product?” This question gets us great feedback which sometimes turns into new features. If people ask for features or report a bug, we also do our best to follow up with the customer to let we should follow up with them and close that lid. If people tell us there’s a bug, we should tell them when the bug is fixed. Just in general, if there’s any other open conversation we should make sure that it’s closed so they felt like we had a complete conversation. After a downgrade – Why? Where to? As you can see, we send a mix of time- and behavior-based messages. We also send feature announcements through in-app messages so as not to clutter people’s inboxes. Because we are able to really test format and content, we see open rates above 75% for all of our emails. We think about lifecycle email as a year-long conversation with a customer, and oftentimes the feedback we receive informs our product direction. I don’t think it’s any coincidence that we have so many happy, successful customers. If you’d like to achieve similar results, why not try a free 14-day trial of Intercom Engage today.